This is how Active Query Builder looks when started. The Query Building Area is the main area where the visual representation of the query will be displayed. This area allows you to define source database objects and derived tables, define links between them and configure the properties of tables and links. The Columns Pane is located below the query building area. It is used to perform all the necessary operations with query output columns and expressions. Here, you can define the field aliases, sorting and grouping, and define criteria. The Query Tree Pane is located at the left. Here, you can browse your query and quickly locate any part of it. The page control above the query building area will allow you to switch between the main query and sub-queries. The small area in the corner of the query building area with the "Q" letter is the union sub-query handling control. Here, you can add new union sub-queries and perform all the necessary operations with them using the popup menu. When working with the query builder you can only see one query or sub-query at a time. 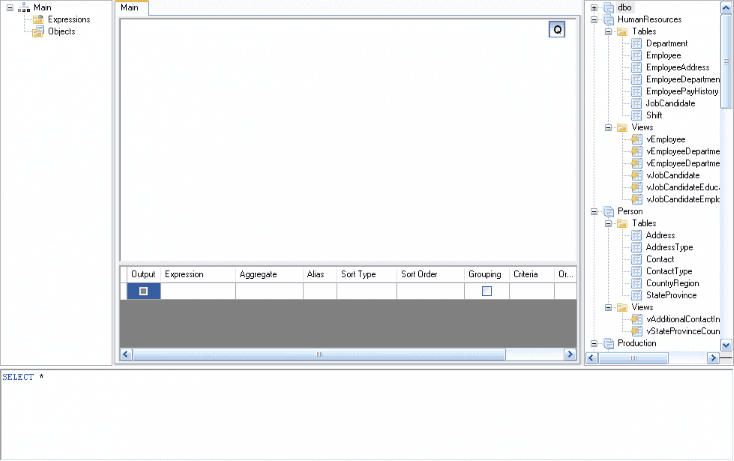 Each single query is represented in the Query Building Area and the Column pane.